The newest unlikely Internet sensation is a pair of barnyard owls. They're not singing "I Will Always Love You" or "I Dreamed a Dream." They're simply doing what owls do. Their owl box in San Marcos, Calif. is totally wired. So when Molly flew in and laid eggs, the cameras were rolling. And when the eggs started to hatch, Molly and her four little owlets became stars. The 24-hour video of their home and growth went viral on the Web. "Early Show" co-anchor Maggie Rodriguez reported their U-Stream Web page now has over seven million hits. Carlos Royal, who installed Webcams in his owl box, told CBS News, "It's addictive. (Fans) don't want to leave. They're afraid they're gonna miss something." And now, Royal is bringing his owl cam to the classroom. Students are now learning how far an owl can turn his head -- 270 degrees -- after being hooked on this reality show. Heather Goetz, a third grade teacher who broadcasts the owl cam in her class says, "It's real life! You know when they're in the movies; they're so used to things being pretend and fake. But now that we've been watching Molly the owl ... it's really piqued their interest." 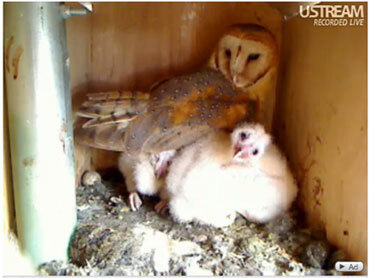 Both Molly, the female owl, and McGee, the male owl, will take care of the owlets while in the nest. Owls are nocturnal hunting birds. They are carnivores and closely related to hawks. Owls sleep during the day and emerge at night to hunt small prey. It is believed that there are a little over 200 species of owls in the world, inhabiting a huge variety of ecological niches, from rainforests to tundra. Owls have a large head and large eyes that face forwards (unlike other birds, whose eyes are on the sides of their head). This eye placement gives them binocular vision and very precise depth perception. Also, there are circles of radiating feathers surrounding each eye, giving them a wide-eyed, alert look. Owls cannot move their eyes within their sockets like we can. In order to look around, they have to move their entire head, which has a range of movement of about 280 degrees. They use their keen sense of sight to find prey in the dark (owls see mostly in black and white). They have an acute sense of hearing which also helps in finding meals. Owls are stealth hunters, they can easily sneak up on their prey since their fluffy feathers give them almost silent flight. The Barn Owl is one of the most widely distributed birds in the world, found on all continents except Antarctica. It is a medium-sized owl. White or mostly white underside. Heart-shaped, white face. Back tawny, marked with black and white spots. Long legs. The Barn Owl is one of the few bird species with the female showier than the male. The female is more heavily spotted. The spots may signal to a potential mate the quality of the female. The Barn Owl has excellent low-light vision, and can easily find prey at night by sight. Its ability to locate prey by sound alone is the best of any animal that has ever been tested. The Barn Owl is the best pest control, eating approximately 1,000 mice a year. These owls are often associated with ghost stories because they fly silently, their white coloring makes them appear to be floating in the night, and their call sounds like chains rattling. The Barn Owl dwells beyond the forest and lives in manmade structures such as barns. These small owls are widespread and common. The Screech Owl is found in nearly every habitat throughout the eastern United States and southern Canada. It is common in urban as well as rural areas and readily nests in nest boxes. It is one of the smallest species. It has feathered ear tufts and is highly camouflaged. Gray, brownish gray, or reddish-brown. Screech Owl pairs usually are monogamous and remain together for life. Found in most habitats with trees, including urban and suburban areas. They are great insect control, and also eat crayfish, earthworms, songbirds, rodents. A screech owl was featured in the Harry Potter movies as one of the Weasley's pets. A large owl of extensive woodlands, the Barred Owl is familiar for its distinctive "who-cooks-for-you, who-cooks-for-you-all" hooting. Head round with no ear tufts. Great Horned Owl is the most serious predatory threat to the Barred Owl. Although they often live in the same areas, the Barred Owl will avoid parts of its territory occupied by a Great Horned Owl. They eat small mammals, rabbits, birds, amphibians, reptiles, and invertebrates. They live in forested areas, from swamps and riparian areas to uplands. Barred Owls typically hunt at night or at dusk by sitting on a high perch and looking and listening for prey, which they catch with a short flight or drop to the ground. Barred Owls can be aggressive, flying at and fighting rivals at the edges of their territory. Found from the Arctic tundra to the tropical rainforest, from the desert to suburban backyards, the Great Horned Owl is one of the most widespread and common owls in North America. It is a large owl with prominent ear tufts widely spaced on head. These feathered ear tufts are not ears, but are part of the owl's camouflage. Although they are one of the largest species, they are not heavy because they have hollow bones. The Great Horned Owl is one of the only animals that regularly eats skunks, because they don't have a sense of smell and their eyes have built in goggles that protect them if they get sprayed. They will take large prey, even other raptorial birds, even regularly killing and eating other owls. Broad diet of animals, from small mammals to rabbits, geese, and herons, amphibians, reptiles, and invertebrates, but mostly mammals. Uses a variety of nest sites, including trees, cliffs, buildings, and the ground. Does not make its own nest. Typically takes over nests in trees made by other bird species. They have a traditional hoot.